Kelley Quan is a successful make up artist in both I NYC and abroad. Her experience with working on some of the most beautiful faces in the world has made her an expert in product application. So, when it came to producing her own brush line, Kelly had to look hard at the industry. With some extensive investigation, the cruel process behind the creation of most makeup brushes became clear. In many cases, animals are either brutally striped of their pelts or maimed without regard while being sheared, especially in countries where animal welfare regulations are either lax or non existent. Eighty-five percent of the fur industry's skins come from animals on fur factory farms—dismal, often filthy places where thousands of animals are usually kept in wire cages for their entire lives. Like the factory farms where animals are raised for food, the methods used on fur farms are designed to maximize profits, always at the expense of the animal’s welfare. All animal hair manufacturers obtain their supplies from fur farms or fur trapper/traders. Kelley’s decision to move completely away from using and supporting the fur industry in order to develop a cruelty-free alternative became the driving force for bringing her luxury vegan cosmetic brushes to market. For Kelley, it became imperative to find a quality and ethical alternative. Initially Kelley’s search for brushes that satisfied all her application needs came well short of expectations. While there are many synthetic makeup brush lines there were none that lived up to their claims—or her exacting standards. The most common complaint from consumers was shedding, the lack of softness or overall poor makeup application. For her own line, Kelley started by selecting nine different synthetics, these fibers have distinct texture and dimension to mimic their animal equivalents, optimizing product delivery and overall softness and performance. They were a success. Now, every brush head is hand crafted and shaped, never cut, to maintain the integrity of each bristle. The effect is a super soft, effective brush that delivers top makeup artistry results. Kelley Quan’s fur-like soft brushes have another added advantage; animal-hair brushes aren't just bad for animals—they're also bad for our skin. Animal hair and fur brushes harbor old makeup, dead skin cells and other contaminants, allowing bacteria to grow in the cuticles of the strand and making them unsanitary and virtually impossible to clean.Kelley Quan signature Vegan Beauty Brushes™ are non porous and can not absorb product, which means washing and keeping them sanitary is healthier for your face and preserves the lifespan of the brush. 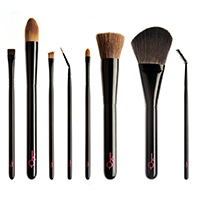 Kelley Quan Vegan Beauty is a PETA Certified brand for Cruelty-free and Vegan Beauty Brushes and are proudly made by hand in New York.